1) Luciano (born Jepther McClymont on October 20, 1964) is a Jamaican Roots Reggae artist. He first begun recording in 1992 under his first name Luciana, with his debut single "Ebony & Ivory" on the Aquarius Record label and followed with his debut album 'Moving Up' for RAS records in 1993. Luciano is the seventh of nine children and was born to extremely spiritual and musical parents while growing up in Daveyton, a small district in the central parish of Manchester, Jamaica. 2) Luciano, born in 1978 in Switzerland and raised in Chile, started DJing in 1993 and producing elctronic music since 1997. In the mid-90's, he was promoting Sense Club and Encuentros con la Technocultura in Santiago de Chile in the company of many initiators of the Latin American electronic music scene: Senor Coconut AKA Atom Heart, Ricardo Villalobos, Pier Bucci, Dandy Jack & brother Adrian Schopf, Washington Miranda, Argenix Brito, Microman, etc. 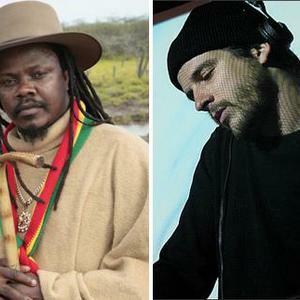 Luciano left Chile at 21 and moved to Europe (2000), settling in Geneva (Switzerland) to launch Mental Groove Records and holding a residency at the Weetamix club. He gradually invaded the inner reaches of electronic culture, forming a partnership with Ibiza's most notorious underground club, Circoloco at DC10, which gave Luciano a perfect platform and a passionate audience for his irresistible, mind-altering blend of barebones techno and hot-blooded Latin rhythms. His releases appear on the Transmat, Perlon, Lo-Fi Stereo, Bruchstuecke and Klang Elektronik record labels. Luciano's mixed Swiss & Chilean identity shows in his music, a somewhat mystical blend of deep techno & electro that integrates southern elements in rhythms and colourful patterns in sound. His collaborations with Ricardo Villalobos (Playhouse, Perlon, Warp, Force Inc etc.) as Sense Club are especially rewarding, as is his partnership with Pier Bucci and Argenix Brito as Monne Automne. Mellowing his style as times goes by, getting more experimental and spacey with a fresh style of his own, Luciano's production is destined to the wiser dancefloors. 2) Luciano (born in 1978) is a Swiss-Chilean DJ, producer and boss of Cadenza Records.